This long trail is named after the many hill ranges it passes through: Frankenwald, Fichtelgebirge, Fränkische Schweiz, Frankenalb. All are situated in the north east of Bayern, a region that is called Franken. The landscape is a pleasant combination of fields and forests, and many old timber framed houses and farms can still be admired. The Fränkische Gebirgsweg starts on the border of Thüringen, where the well known Rennsteig ends. It heads south in wide loops, choosing tracks and trails and avoiding urban environments. The trail is well documented and waymarked. 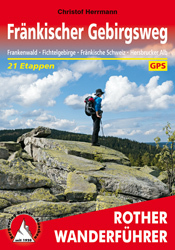 Official website of the Fränkische Gebirgsweg, containing all you need to know about the trail, maps, dexcriptions, lodging, GPS, sights etc.